My fourteenth ground of 2015 was on Monday 31st August at High Road in Chipstead, Surrey. 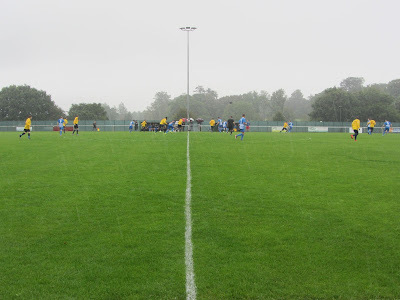 The match was Epsom & Ewell vs. Raynes Park Vale in the Combined Counties League Premier Division. High Road is in a rural setting to the south of Chipstead around 1.5 miles from the village's railway station. While Chipstead FC are the owners of the ground Epsom & Ewell have played there since 2012. 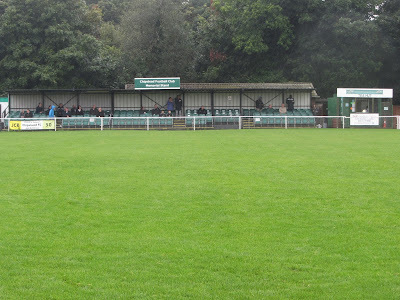 The club have gone through numerous groundshares since their West Street Ground was sold in 1993. The 157 seat Memorial Stand is situated on the western side of the ground. This stand replaced an older wooden structure in 2004 and it was extended in 2007. To the north of this stand is a food outlet and a couple of benches. To the south of the stand are the changing rooms and the club house which extends outside of the turnstiles. The remainder of the venue is hard standing with one other covered area in the south-west corner behind the goal. Added in 2006 this area has a raised concrete platform. 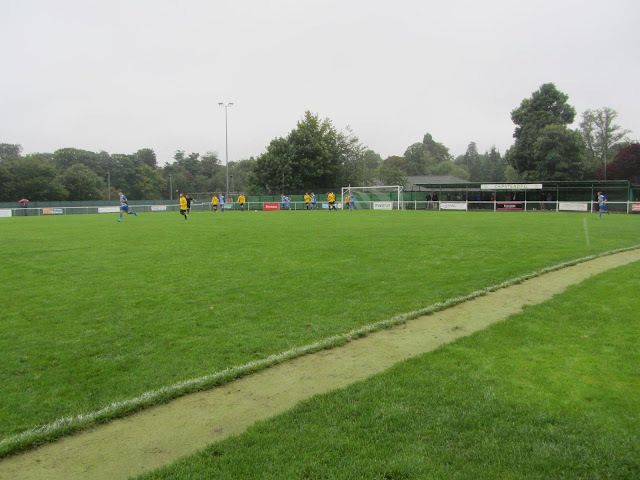 Though quite a compact venue High Road does include several mini football pitches to the north and east of the ground itself. 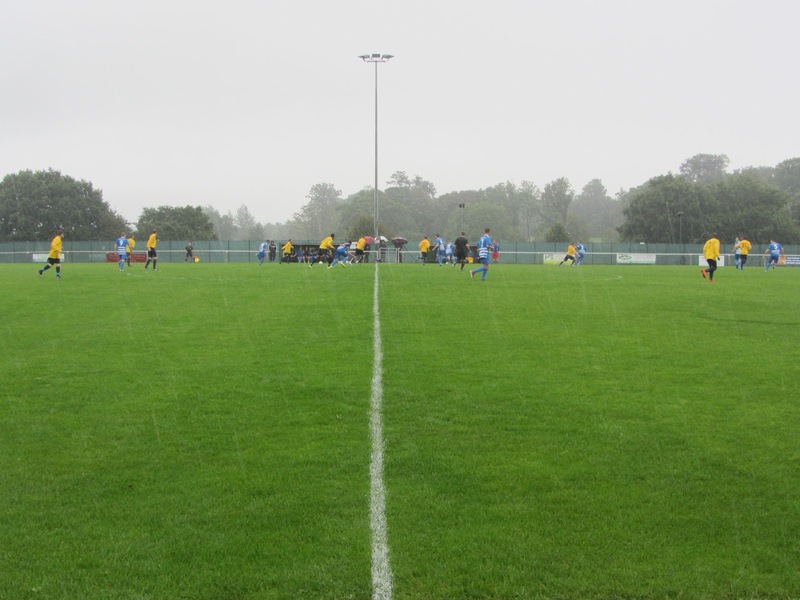 With a torrential downpour starting as the teams walked onto the pitch the opening period of the game was a scrappy one and it wasn't until the rain died down a bit that a proper game ensued. 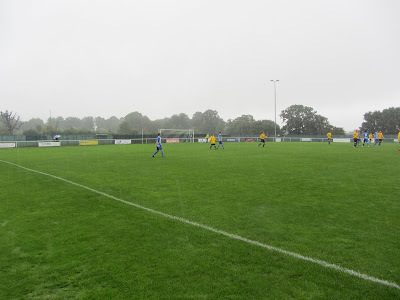 The home side took the lead in the 26th minute after excellent work down the wing by Beckett Oliver culminated in him crossing into the box and an under pressure defender ended up chesting the ball into his own goal from a couple of yards out. Epsom went 2-0 up in the 40th minute after a corner was nodded down to Kyle Hough who smashed the ball into top corner of the net. The visiting side were second best all afternoon and fell further behind in the 75th minute when Kyle Hough netted again. This one was the best goal of the game as Hough beat a couple of defenders before drilling a shot into the bottom corner from just inside the box. Immediately after this Epsom almost added a 4th from a corner but a goalline clearance saved Vale's blushes. The visitors did get a consolation back in the 85th minute when a corner was headed in on the line but could have no complaints about the scoreline.